Putting aside the goals and targets, the wider politics of the Sustainable Development Goals might just about create some space for genuine transformation. 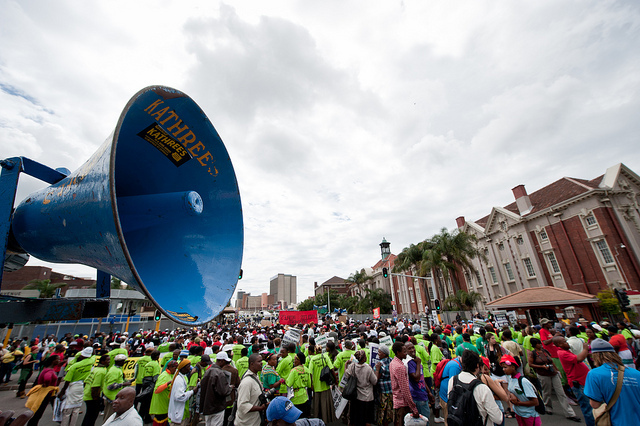 Demonstrators gather to call for action on climate change in Durban. Photograph by Ainhoa Goma/Oxfam. Later this week, heads of state will assemble in New York to launch the Sustainable Development Goals. The agreed text lays out 17 goals and 169 targets. It is an ambitious agenda for all of humanity. But will they make any difference? We have had the Millennium Development Goals (MDGs), which were launched with similar fanfare in 2000. These focused on “˜development’ and “˜poverty’, but were similarly high-sounding. Promoted heavily by Jeff Sachs, we were told that bed nets, vaccines and agricultural technologies were going to save the world. Big money from international donors and philanthropists came behind them. I must confess I was a deep cynic in 2000. The “˜aid’ frame of the MDGs meant that implementation was subject to the usual top-down impositions and there were many limitations, with the added burden of the target-oriented audit culture and all the distortions this creates. Was aid going to be a saviour or band aid unable to address the real structural causes of poverty and inequality? Did the MDGs just reinforce a world order where underdevelopment was the consequence of capitalist power and control in some parts of the world? Maybe. So what happened since 2000? There have been major changes in the world economy, and with this geopolitics. The old aid frame with Western nations and rich philantrophists from the US setting the agenda has gone (or at least partially). The declines in aggregate poverty achieved since then were not largely the result of MDG interventions at all, but the growth of China (and also India, parts of Latin America and more recently some countries in Africa). These changes were not driven by goals and targets, or village pilot projects such as Sachs’ much criticised Millennium Villages, but by economic aspiration, capitalist expansion and growth. But I must admit that my cynicism for the MDGs has waned over 15 years, and this gives me hope for the SDGs. There are a number of reasons for this attitude. Investment linked to MDG targets has in some places resulted in significant gains. Ethiopia was one country, for example, that took the MDGs seriously and its statistics are impressive. Child mortality is down by two-thirds from 1990, and various other targets – on women’s empowerment, nutrition and food insecurity – have been met. Yes, there have been distortions – sometimes a blind focus on a target, forgetting the wider picture – but the effect has been galvanising. A commitment to a new state-led developmentalism is especially apparent in Ethiopia, but it’s evident elsewhere too. And in a period dominated by the neoliberal mantra of economic discipline, the retreat of the state and reliance on the private sector and voluntarism, the efforts of states like Ethiopia have been impressive. Perhaps most importantly, the MDGs opened up a political space for a debate about development too. The UNDP’s MDG “˜campaign’ was important in keeping a development agenda on the radar of governments around the world. These commitments were amplified, extended and supported by the major efforts of NGOs and civil society groups. Without such collective action and political pressure, the temptation to cut aid budgets in the face of the late-2000s financial crisis would have been even greater. Summits and grand UN meetings may have been performative circuses, but they have also provided a focus for advocacy and challenge. The politics of global summitry can be one where new ideas emerge, creating spaces for more radical alternatives. Moving beyond target culture and shifting towards generating globally-agreed norms for policy and action – as has happened around human rights, women’s rights and the environment – is perhaps a more appropriate focus for advocacy, rather than getting hung up on all the goals and targets. In a period of financial crisis, austerity, inward-facing nationalist politics and a geopolitics overtaken by the “˜war on terror’ post-9/11, the MDGs were in some way an important counter, offering a more internationalist vision of development and a confirmation of UN ideals. 15 years on, I have emerged with a somewhat less cynical view. But what of the SDGs? Might these offer the same? If you read the SDGs document, you will probably despair. It’s full of high-flown rhetoric and grandiose statements – most of which are rather meaningless hot air and grand gestures. Great fodder for the cynic. But I think if we (largely) forget the goals and targets, and instead focus on the wider politics of the SDGs, we can perhaps see some radical potential. There are five things that might help assuage the cynic in me. Firstly, the launch this week and the continued presence of the goals, agreed by all nations, opens up a political space as the MDGs did in 2000. Like then, it will have to be followed up by an energetic campaign and radical voices will need to enter the debates to keep governments on their toes. Today, the broader conditions for a new argument for development are even less promising than in 2000, so we need to catch the moment and make the case. Second, the SDGs are universal. This is not a development document with the unequal relations between donor and recipient inscribed. Instead, it is as relevant to the UK as it is to Zimbabwe, and accountabilities and commitments must work in all directions. This is an important departure from the MDGs that had the old post-colonial aid framework at its core. Recently, the SDGs were discussed by the UK government’s International Development Committee, but it should have been discussed under Home Affairs too. Third, the explicit linking of sustainability and environmental concerns, especially climate change, is vital. Long-term, sustainable development cannot forget this. The MDGs pigeon-holed environmental issues and did not see them as being integral to all development. Making sustainability centre stage is crucial as the world negotiates a future in the context of climate change. It brings development closer to environment, and so makes the connections that have been attempted repeatedly in Stockholm, Rio, Johannesburg and Rio again. Fourth, what is needed along with the wider campaign for sustainable development is what emerged from the 1992 Rio Summit on Environment and Development – a local level movement based on practical change on the ground. Back then it was called Agenda 21, but it petered out and sustainable development increasingly became the domain of global summitry and COP events associated with climate change. But without practical enactments of sustainability and a radical realisation of what it means in different places, the big ambitions will fall flat. Fifth, a new developmentalism, linked to a universal commitment to an internationalised solution amongst the community of nations, gives the UN a pivotal role. As a new Secretary General is sought, I hope that whoever is appointed will keep these visions central and push member-states to ensure consistent financing and concerted action towards the goals. This will not just mean carping at the failures of so-called developing nations, but will also mean keeping developed nations to their word. Green transformations involve politics, and require high level goals as well as, most crucially, organised collective action. As we discussed in the book The Politics of Green Transformations, these may occur through a variety of processes, led by technology and innovation, state intervention, market reforms or citizen actions. Lessons show that sustained transformations to sustainability require political coalitions between groups through mobilisation across sites and scales. If the SDGs are to have meaning, it is this new politics that will make the difference, and not getting hung up on the many goals or targets. Ian Scoones is a research fellow at the Institute of Development Studies and co-author of the book Zimbabwe’s Land Reform: Myths and Realities. This post was originally published on Zimbabweland.